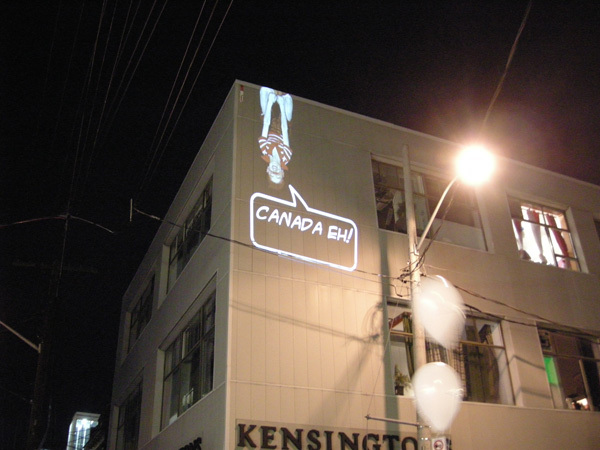 Participating in Nuit Blanche with the Infinite Exchange Gallery I put the bubbles up in the Kensington Market area of Toronto. I decided to use the jungle gym boy so that the sent messages became his. Eyes closed and a pleasent smile the jungle gym boy steals your messages and makes tham his for the audience in the street to judge the creativity behind what you sent. While in Canada the US Dollar dropped below the Canadian Dollar. Who’s owning who now. Thanks to: Jennifer Delos Reyes, Lori Gordon, Brette Gabel, and Stacey O’conner.